Think about it, it is the largest opening into your home, so you want it be secure. You also want to be able to control it from anywhere in your house. You also want the system to be smart. First- Convenience. It’s extremely handy to be able to first “see” if the garage door is open from all over the house, and then to control it from there as well. This is easily done with a keypad placed throughout the house, or at least in prime locations like the kitchen and each entry way. Check out this diagram from Smart Home.com to show what I mean. An individual button can be set up (either using the 6 button or 8 button keypad) to show at a glance both if the door is open (LED light on- for example) or closed, and then it also gives you the ability to close the door right then and there. Second- Security. With some simple scripts you can set it up so that the garage door always closes itself after a set amount of time of being opened. This way as you drive away you don’t have to worry if you left the door open. Or, the home can notify you, audibly, via a whole home audio system through speakers placed throughout the house, if the door is left open, say at a certain time each night. “Excuse me, but the garage door has been left open, would you like me to close it for you?” This can be at 8pm each night, or something to that affect. 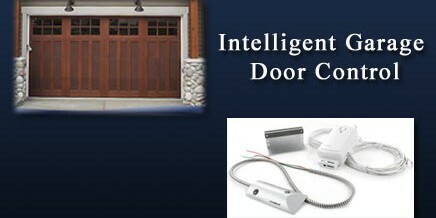 The nice thing about using the system we use is that it works in conjunction with your existing automatic garage door opener and an Insteon Network. Plus, it is very affordable. If you’d like us to help you automate your garage, or any other part of your home, give us a call (321) 252-9342, or email us. Thanks for checking us out, we really appreciate your support, and would love to talk to you about this amazing and fun field of home automation. We’d love to hear from you and hear about what cool home automation projects you have been working on. You can check out our videos on YouTube, And as always, don’t forget to Follow us on Twitterand Become a Fan on Facebook. Thanks, we look forward to connecting with you!